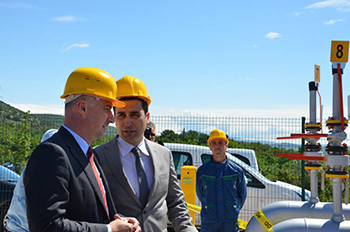 Review of Concluded Contracts of "Procurement of Lesser Value to Which the PPA is not Applied"
Today the Minister of Economy Ivan Vrdoljak opened the 4th section of the gas transmission system of Lika and Dalmatia at a ceremony in Dugopolje at the Plinacro measuring reduction station Split. This was preceded by the successfully completed construction of extremely demanding main gas pipeline Benkovac – Dugopolje, 96.5 km long. Plinacro invested 277.7 HRK million in its construction and the associated equipment. The required funds were provided from own resources, and partly from the funds of the European Investment Bank (EIB). The main gas pipeline Benkovac-Dugopolje, of a pipe diameter 500 mm and a maximum operating pressure of 75 bar is the 4th part of the gas transmission system Lika and Dalmatia. This part of the system is situated within the southern part of Zadar County, with the town Benkovac and municipality Stankovci, in the area of Šibenik-Knin County that includes the towns Vodice, Skradin, Šibenik, Drniš, Knin and municipalities Pirovac, Tisno, Bilice and Biskupija, and in the area of the northern part of Split-Dalmatia County with the town Solin and municipalities Prgomet, Primorski Dolac, Seget, Lećevica, Klis and Dugopolje. The fourth part of the system of Lika and Dalmatia from Benkovac to Dugopolje is a part of the planned and constructed Croatian gas transmission system. This pipeline is a connection with the existing Croatian gas transmission system and provides the gasification of Zadar, Šibenik – Knin and Split – Dalmatia County. It comprises the main gas pipeline Bosiljevo – Split as well as the regional gas pipelines Šibenik – Knin and two connecting gas pipelines for Tisno on the island of Murter and Trogir. The construction of the stated gas pipeline started in July 2011, and ended in February 2013. The use permit was issued on 29 April 2013 upon the carried out technical inspection. By the completion of this project Plinacro achieved that almost 95% of the Croatian territory is covered by the state-of-the-art gas transmission system. The continuation of the development of the gas transmission system towards the south is planned through the construction of the Ionian-Adriatic Pipeline by which the Croatian gas transmission system should connect to the TAP (Trans Adriatic Pipeline) project. Then the preconditions of supply of the Caspian gas to the Croatian and the surrounding market should be met, and the 100% of the Croatian territory should be covered by the gas transmission system.